The Chevrolet Captiva is a compact crossover SUV that was developed by the South Korean manufacturer Daewoo, and has been sold by Chevrolet since 2006. It is a crossover and straddles the entry-level SUV segments. It utilises the GM Theta platform and derives from the Chevrolet S3X concept car revealed in 2004. The Theta platform also underpins the Opel Antara, the Captiva’s mechanical derivative also built by Daewoo. Sold internationally as the “Chevrolet Captiva”, South Korean-market cars were badged Daewoo Winstorm up until 2011, when the international name was adopted. Australasian-specification models are badged Holden Captiva. A revised Captiva range was released in the second quarter of 2011. 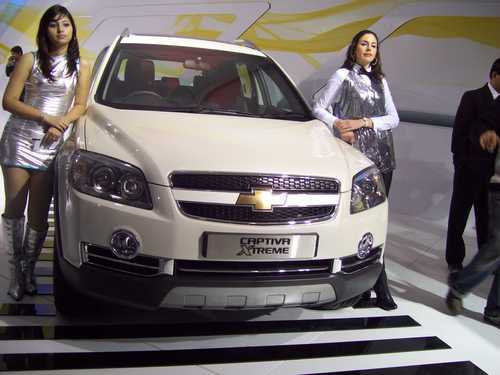 The facelifted Captiva features a new front fascia reminiscent to that of the Chevrolet Aveo (T300). Other noticeable cosmetic differences comprise LED turn signals on the door-mounted mirrors, redesigned wheels and revised side air vents. The new SIDI alloy V6 was supplied from Holden in Australia, with the petrol four cylinder 2.4L and VM Motori 2.2 L turbodiesel engines being made in South Korea.